“There’s something about working with attic space that I find especially charming–getting away from the strictly vertical and horizontal gives space a certain liveliness that’s hard to find in ‘typical’ rooms,” Richard says. 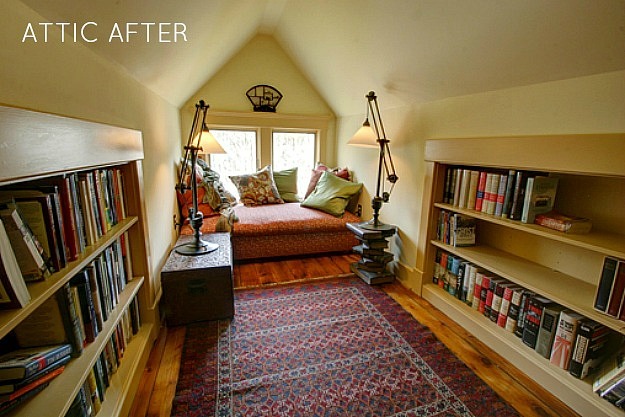 Love the cozy reading nook with the built-in bookshelves. Thanks to Richard for sharing his project with us. For more photos and information about the attic’s transformation, visit RTA Studio. Wow, just wow. We don’t really have attics (or basements) here in Australia so I have always, always loved anything to do with them. That transformation is pretty amazing. Hard to believe this is the same place. So light and airy. I couldn’t love it more! I’ve already done something similar with our bungalow attic . . . IN MY HEAD. Thanks for the inspiration. And what, pray tell, did they do to ensure that the bats won’t be back? They like dark quiet places. I had a problem with opossums. Someone told me to put a lamp and a radio and they will leave on their own. And they did. The bats will probably not come back. Yeah, and I’m sure they sealed up the areas they were coming in and out of when they finished it. We can assure you–we’re bat-free. Everything is quite snug. Perfect. The colors, the charming angles, the furnishings, the hardware and fittings. May you enjoy it for many years to come. I once owned a four-square with a large, walk-up attic. It was a wonderful space. Oh this is amazing! I loooove the way this space has been decorated. Just gorgeous. I have an old house (1890) which has an unfinished attic, but there are roof level issues that make it impossible to finish it as livable space. The roof has been heightened at some point, but a new roof was constructed above the original one. While it’s cool to be able to see the original rooftop in the attic (antique cedar shakes and all), it would be nice to be able to finish the space as Richard Taylor has done. I want that reading nook!! This is such a fun transformation to see. I have an entire floor available in my 1901 Victorian “expandable” bungalow, but I haven’t needed the additional space yet. Believe me, I have thought long and hard about what I’d do if I did expand it, and it looks a lot like this home’s result. Another house to love. I love the way they used doors and woodwork to pay tie the space to the time the house was built. The sinks in the bathroom both tie to the time of the house but also by having two of them it ties to now. The exposed brick chimneys are a “nowthing” but the feeling is still very connected to the old house feel. I could set in the “Book Nook” all day. What a view it must have. I love it. What an amazing space they have created. It’s absolutely perfect. Very clever! Very cute! 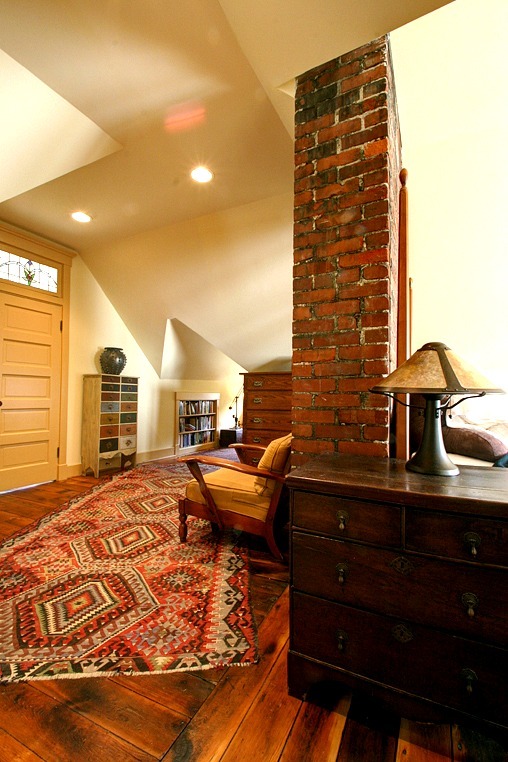 I love that they kept the shape of the attic and the exposed brick chimney! What a wonderful space! This is great! 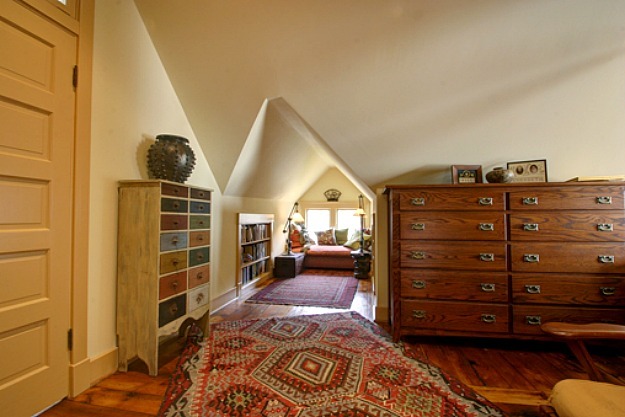 I’d love to finish our attic and make an art studio for myself. It’s in much better shape than this one was in originally, but unfortunately it’s completely full of junk!! Love it, especially all those nice little nooks. Would love to expand our attic by adding dormers and make it into a nice second floor bath. If only I could win the lottery! Too cool! The only thing I might change is the bathroom floor tile–love the black and white tile, don’t get the slate (or slate-like) tile…I just love seeing old houses loved back to life like this! Thanks. What a gorgeous transformation. I would live there in a heartbeat — there’s even room to make more of a living room and have it as a mother-in-law suite. The reading nook is to die for. And oddly one of my fave things is the little low wall in the bath hiding the toilet. That is remarkable! Great use of space and light! 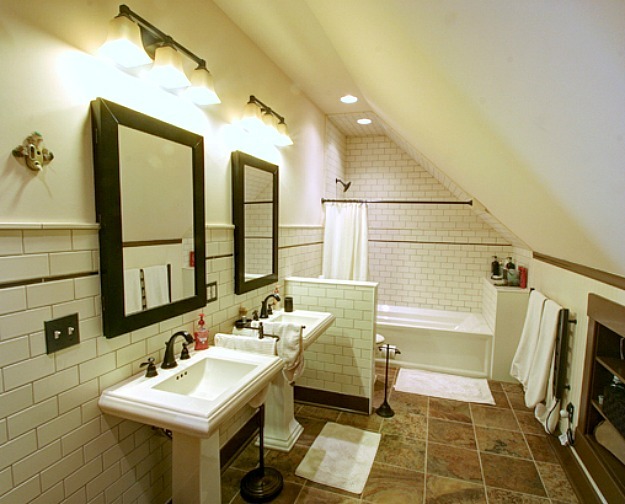 Great makeover – I love the bathroom! Such a cozy space. Beautiful! I especially love the exposed brick and window seat. I’ve heard that Granville is a very cool town (I believe Amy Butler lives there). Hope to visit it one day soon! What a nice and fun place. The transformation is amazing. I’m sure this attic will add a lot of value to their home. This is gorgeous love everything about this space and those rugs…… We don’t have attics over here and we don’t have those rugs unless you are willing to pay a couple of thousand and who has those to spare…. Hi Julia this was great thank you for sharing. Till next time Regards Esther from Sydney. PS I did spoil myself once and bought this beautiful rug it took me six months of thinking and visualising what can I say typical female. Wow, what a impressive transformation…I LOVE it! Love it! 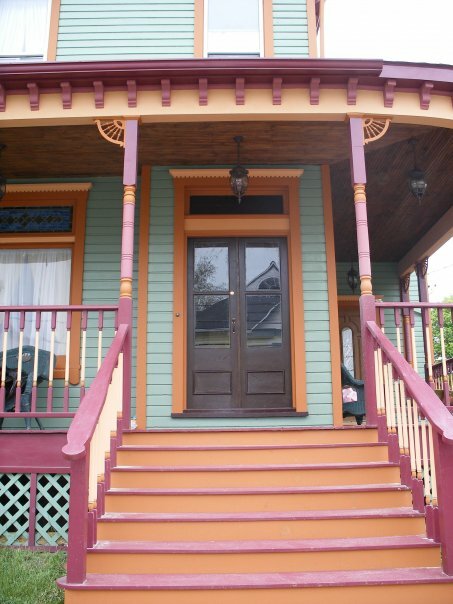 They did a wonderful job of making it functional and keeping it in character with the doors and mouldings and bathroom. I love spaces under the roof with their slopes and angles and nooks – it makes one feel very sheltered and enclosed. I particularly love the reading nook. What a beautiful project! Wow! Now I am going to put on my Animal Rights Activist Hat. Many breeds of Bats are in jeapordy of extinction. To that end, I hope the owner was mindful of removing the bats. Then again, my gut tells me he probably hired an exterminator which is a tragedy. Most people associate bats with rabies and that is a misnomer. Bats play an important role in our eco-system: mainly they eat mosquitos, especially those carrying West Nile. Without bats, we would be overrun with mosquitos which in turn, will cause towns to spray a toxic chemical (does anyone remember Silent Spring by Rachel Carson? If not it is a must read). Fortunately, your gut is dead wrong–we did not hire an exterminator. We quite like bats. Once work started any bats that has been there cleared out on their own–I suspect they were even less interested in sharing the space than we were. That is terrific news. Thank you for replying. Oh my goodness, I was thinking the same thing! I am involved in a project that counts bats as they are dying by the millions from white nose disease. So glad you brought it up and very happy to see the owners did not hire an exterminator. For anyone planning an attic renovation, please consider that bats may be in your attic and be compassionate enough to remove them humanly, especially if they have young … Lovely renovation and great use of space. Thanks for commenting. When I discovered Bat World Sanctuary, I learned that everything I knew or thought I knew about bats is wrong, and I suspect I’m not the only one out there. As an animal rights activist/volunteer, I try to dispell some of the myths surrounding animals, especially negative myths that could potentially foster continued fear. Well, that just put a grin on my face, too darn cute! So glad to see another friend of bats on here, they are misunderstood, misaligned and are dying by the millions. 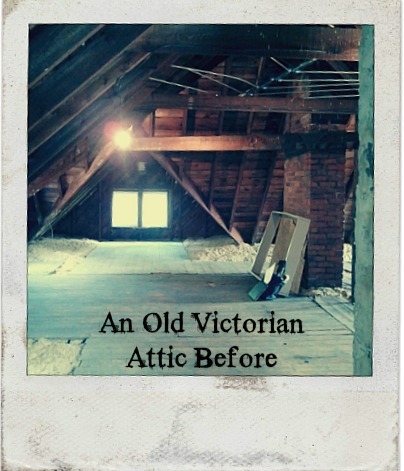 Bats are particularly fond of attics so I was happy to see this renovation featured, it brings this frequent issue to the attention of those who may be renovating their own attic. For those who are, it’s easy to seal off their entrance and provide other housing such as a bat house, if you choose. Simple instructions using only a piece of screen and some tape (that’s all you need!) across the top and sides, leaving the bottom loose enough so they can crawl out but not back in, can be found on many bat websites. Late August, when the young have learned to fly, is best or they will starve. If you are not sure where they are entering and exiting your attic, simply stand at a different corner of your house each night 1/2 hour before dusk and you will see exactly where they are getting in. They are active from April until fall. It is an extremely small effort for a homeowner to make to help keep this species alive. Many thanks to those who are willing to try! I knew you had typed “Darn”. LOL! 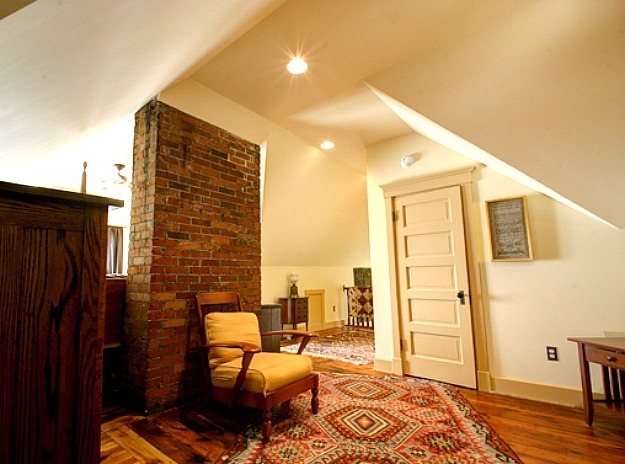 We think Rich did a wonderful job with the design of the attic–his vision realized all of our hopes for the space. We’d also like to thank Mark Caughenbaugh of CS Construction for his excellent management of the project, and most especially master carpenters Joe McClain and Dave Elliot, whose uncompromising standards and craftsmanship brought all of these odd angles and undulations into functional reality. I’m applauding here! What a terrific space and shows creativity…preserving the angles, original brick, floors…keeping the history & character of the Victorian and yet freshening it up…and, keeping it unique. So many renovations strip out all original charm so this is wonderful to see. I absolutely love vintage red brick (my fireplace is such)…and, I sure envy that reading nook…my dream house would have a cozy attic room and window seat. What a wonderful space it turned out to be. Congrats to the homeowners and Richard Taylor on a great job. It looks so cozy! Beautiful! We have a 1910 home that looks very similar and has almost an exact attic. No bats, but occasional mice. Needless to say, I’ve only been up there about 3 times. We’d love to have this kind of master suite with all the awesome nooks, sloped ceilings, and great private cozy space–maybe someday–awesome inspiration! Thanks! This is beautiful and I would love to see what they did to the rest of the house! Rich is getting ready to design our kitchen remodel–perhaps it’ll be worth a posting in six months? What a cool space. 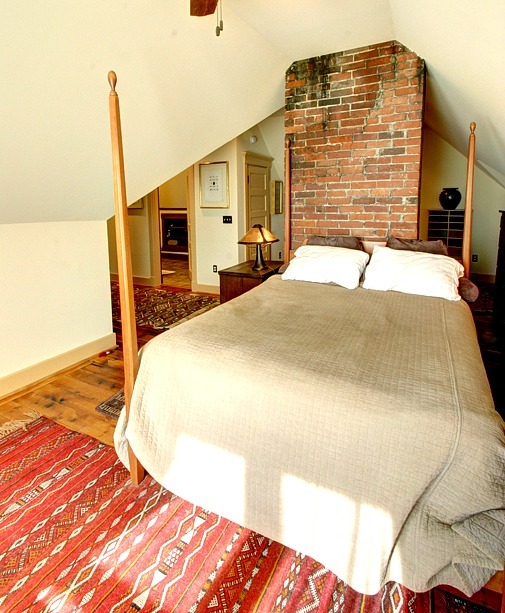 I love the old (even kind of creepy) chimney sitting in the middle of everything reminding the bedroom of its roots. Very charming, cozy and kind of like a romantic hide-a-way. If the owners are still checking comments, could you please disclose the source for your attic’s wood floors? I am in love. 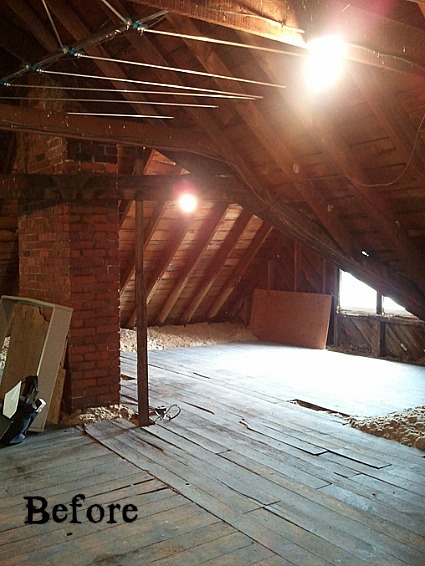 The floor is original to the attic–what you see in the “before” pictures was sanded and polyeurethaned. 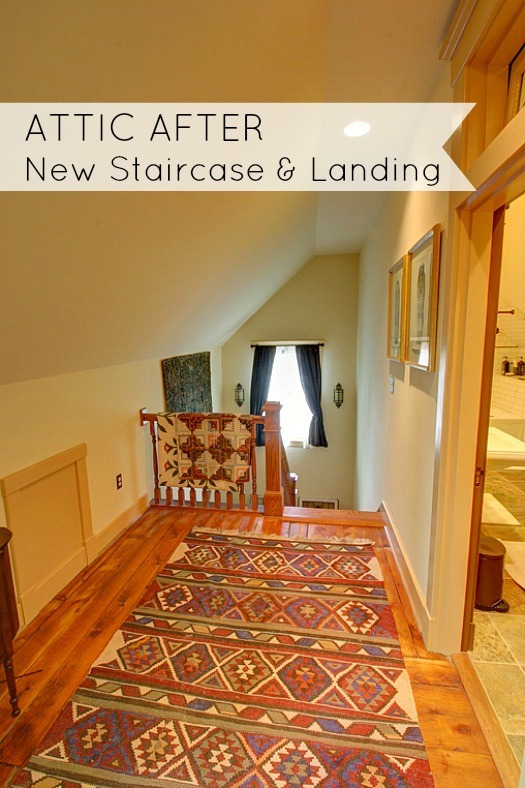 We wanted to use as much original material as we could; there was enough old flooring pulled up from the new stairwell and bathroom area to patch and repair problem areas in the rest of the attic. You do have a couple options if you don’t have old floors–wood flooring is sold in grades; we were told by the flooring guys that our old floors were comparable to what is called “tavern grade” (jokingly described as one step up from kindling). This is flooring that includes flaws and knot-holes. Another option is salvaged flooring–but as demand is up for it, it’s not necessarily an inexpensive option. I hope that helps–I’m glad you like the floors. I love the built-in bookshelves! Amazing!